Manhattan Community Board 6 has adopted a resolution in support of a state law to bring back flashing blue lights on Select Bus Service buses. The reso also urges the MTA to explore options to restore the lights in lieu of legislative action. SBS buses went into service in 2008. The buses and their flashing blue lights — which help riders distinguish between SBS and local buses — operated without incident for four and a half years, until the MTA brought SBS service to Staten Island’s Hylan Boulevard. Last January, the lights were switched off after City Council Member Vincent Ignizio complained that motorists, himself included, were confusing SBS buses with emergency vehicles. Though an obscure state law limits the use of flashing blue lights to volunteer firefighters, no legal action was taken to get the MTA to stop using the SBS lights. A 2010 Daily News story about the regulation provoked no official response. No bus driver was ever ticketed for using the lights. An MTA spokesperson told Transportation Nation that the agency had received all of one complaint from the public, after the launch of the inaugural SBS line in the Bronx. Ignizio was a leading critic of the effort to bring SBS service to Hylan Boulevard. In 2009 he co-signed a letter to NYC DOT Commissioner Janette Sadik-Khan complaining about proposed median bus lanes and boarding platforms on the grounds that they would take away parking. In response, DOT and the MTA altered Hylan Boulevard SBS significantly, nixing the median lanes in favor of non-continuous curbside lanes. Ignizio purportedly approved of the watered down version of Hylan Boulevard SBS, which launched last August. 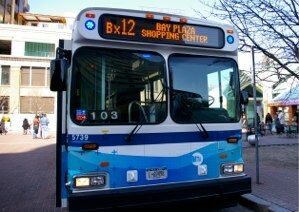 A bill from Assembly Member Micah Kellner would authorize the MTA to use blue lights. The bill has three co-sponsors and no companion bill in the Senate. Staten Island State Senator Andrew Lanza also lobbied Lhota to have the lights switched off. The CB 6 resolution [PDF] was approved by the full board last week, and was sent to Assembly Speaker Sheldon Silver and Senate co-leaders Jeff Klein and Dean Skelos. It says bus riders are “unable to see and distinguish an approaching SBS bus several blocks away … something especially important after dark or in inclement weather.” Further, the reso urges the MTA to “explore all avenues” to restore the blue lights in the meantime. The MTA has said it is looking for an alternate color. City Council Members Dan Garodnick and Melissa Mark-Viverito, who represent districts served by East Side SBS, have asked newly-named MTA chief Tom Prendergast to bring back flashing lights, regardless of color. So far though, the Facebook campaign to have SBS lights restored has just 27 likes, compared to Ignizio’s 100. > Vincent Ignizio complained that motorists, himself included, were confusing SBS buses with emergency vehicles. So, “flashing blue lights” means “get out of the way”. I don’t see a problem with that. The bus services which are used for some special purposes or city buses or government bus services should use some unique lights for their symbols. It will act as a unique code which helps others to recognize them specially at night. Several buses always passes at night through the city roads which includes these special buses along with other local buses. So this will be difficult to recognize them at night. The blue lights are not an obscure law. It is in the VTL & is only authorized for the rear of police, fire, and Ambulance vehicles. It is for safety to alert drivers of the presence of emergency vehicles at a an incident. Many states, especially neighboring NY have the same regulations. Oh, snap, I didn’t know till now that Streetsblog gave a plug to the Facebook campaign to get the lights back on! Thanks! When Will Select Bus Service Get Its Flashing Lights Back?